The Saint Paul Public Library website will be updated the morning of April 9. 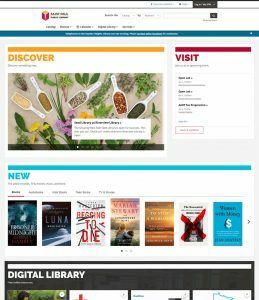 Basic functionality and navigation of the site will not change, but you will notice a new look to the homepage, format browsing pages, and pages about library programs. The update will begin at 8:00 a.m. on Tuesday, April 9, and is expected to take about 1 hour to complete. Catalog search functions, account access, events calendar functions, and overall site navigation will remain the same. A new Explore page has been developed for the website that will allow you to discover the wealth of content that has been promoted on our website. Visitors can serendipitously access this page by clicking on section titles, exit links, or taxonomy terms that are displayed on website content. Find this page at sppl.org/explore once the new site launches. Upgraded tools will let the library showcase events, services, and collections in new and interesting ways. We are also taking this opportunity to update the browsing pages, pages that feature programs like Homework Help and Createch, and the homepage. Our website provider has invested heavily in building accessibility into the upgrade. The new site software was designed, built, and tested with accessibility by screenreaders or other displays in mind. We will be releasing the upgrade of our website on Tuesday, April 9, starting at 8:00 a.m. The upgrade is planned to take between 30 and 60 minutes. During that time, visitors will not be able to access the website and will instead see a maintenance page. Access to Sierra, the classic catalog and the mobile app will not be affected.